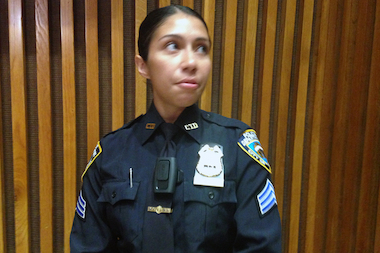 Sergeant Andrea Cruz demonstrates the VieVu LE3, a pager-size camera worn on the front of an officer’s shirt. NEW YORK CITY — The NYPD is going forward with a controversial $6.4 million contract to purchase body cameras from a Seattle-based startup despite objections from the comptroller's office and complaints by other police departments across the nation, DNAinfo New York has learned. Police officials sent a two-page letter to Comptroller Scott Stringer's office saying he had not provided legal reasons to withhold his approval of the NYPD's contract with body camera manufacturer VieVu to prevent them from equipping 1,000 officers with cameras from the company. “The fact that the Comptroller did not cite any of the statutory (reasons) . . . or raise an applicable objection, the Contract is deemed registered,” Deputy NYPD Commissioner for Legal Matters Lawrence Byrne wrote. Under the City Charter, the Comptroller can withhold approval of any contract if an agency lacks funding for the project, lacks approval of the Mayor’s Office or Law Department, or there are allegations of fraud or corruption in the awarding process. Since the department has sufficient funds and the mayor and Law Department have both signed off, the only grounds would be possible corruption. The NYPD insists that there are no ongoing fraud investigations of the contract, only concerns that involve "policy" or "internal procedures," such as how video will be stored and for how long. Stringer's office had 30 days to approve or reject the NYPD’s contract, and last Friday, just before the deadline, it announced it would not sign off on the contract, citing a 2015 Department of Investigation report that raised 23 concerns about how the program would be implemented. The comptroller requested additional information, but the city and NYPD say they have already responded to those 23 concerns. A Stringer spokesman said the office doesn't oppose officers having body cameras, just has concerns about company selected for the contract. VieVu lost contracts with police departments from Arizona to Ohio over "faulty" cameras and unreliable video quality, DNAinfo reported previously. "The city has opted to deem the contract registered while being fully aware of a pending [Department of Investigation] investigation and that's their choice," a Stringer spokesman said. "The comptroller supports body cameras, and wants to see this critical reform succeed." A DOI spokeswoman declined to comment. Sources said that the NYPD convened a nine-member panel to study more than 50 proposals from 17 body camera vendors before winnowing the field down to two finalists: VieVu and Taser. Both companies scored nearly identical marks on their equipment, recording scores of 83 and 85, respectively, the sources said. But their blind bids were roughly $11 million apart, with Taser seeking $17 million compared to Vievu’s $6.4 million, which was the deciding difference, sources say. “We considered every issue raised by other competitors and other departments, and we are satisfied we have fully vetted every aspect,” said a top police official. On Monday, Mayor Bill de Blasio blasted critics of the deal, saying "a lot of information has been put out to try and denigrate" VieVu. “I don’t think it’s the first time in the history of the free enterprise system that we’ve seen one company try to smear another,” he said. A VieVu spokesman defended the company, saying "the city and NYPD did an exhaustive, independent review of all proposals and determined that Vievu’s technology and pricing were superior." The use of body cameras for police has been a national issue following several high–profile police-involved shootings. The city’s largest police union, the Patrolmen’s Benevolent Association, signed a new contract with the mayor last week that agreed to equip all NYPD officers with cameras by 2020.